Characteristics of the two types of plastiglomerate. (A) In situ plastiglomerate wherein molten plastic is adhered to the surface of a basalt flow. Field book is 18 cm long. (B) Clastic plastiglomerate containing molten plastic and basalt and coral fragments. (C) Plastic amygdales in a basalt flow. (D) Large in situ plastiglomerate fragment. Adhered molten plastic was found 15 cm below the surface. Note the protected vegetated location. Recognition of increasing plastic debris pollution over the last several decades has led to investigations of the imminent dangers posed to marine organisms and their ecosystems, but very little is known about the preservation potential of plastics in the rock record. As anthropogenically derived materials, plastics are astonishingly abundant in oceans, seas, and lakes, where they accumulate at or near the water surface, on lake and ocean bottoms, and along shorelines. The burial potential of plastic debris is chiefly dependent on the material’s density and abundance, in addition to the depositional environment. On Kamilo Beach on the island of Hawaii a new “stone” formed through intermingling of melted plastic, beach sediment, basaltic lava fragments, and organic debris. The material, herein referred to as “plastiglomerate,” is divided into in situ and clastic types that were distributed over all areas of the beach. 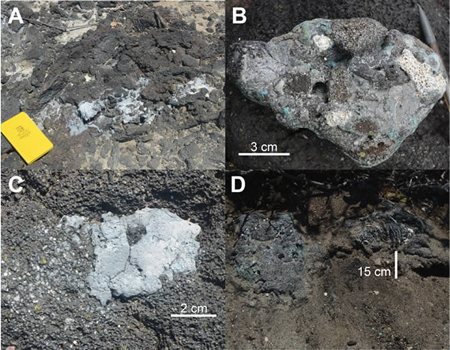 Agglutination of natural sediments to melted plastic during campfire burning has increased the overall density of plastiglomerate, which inhibits transport by wind or water, thereby increasing the potential for burial and subsequent preservation. This anthropogenically influenced material has great potential to form a marker horizon of human pollution, signaling the occurrence of the informal Anthropocene epoch. According to the geologic timescale, we are currently living in the Holocene epoch. However, Crutzen and Stoermer proposed the term “Anthropocene” in the year 2000 A.D. to represent the period of time between the latter half of the 18th century and the present day. Although other workers have considered the onset of this informal epoch to have occurred at slightly different times, researchers agree that the Anthropocene is a time span marked by human interaction with Earth’s biophysical system. Geological evidence used in supporting this assertion comes from Holocene ice cores and soil profiles. For example, methane concentrations measured in ice cores display an increase of CH4, which contrasts with the expected decline in CH4 at that time, based on the orbital-monsoon cycle theory. Ruddiman and Thomson propose in 2001 A.D. that this anomalous rise in CH4 can be linked to early agricultural practices in Eurasia. In addition, an increase in atmospheric CO2, as determined from ice cores, was explained by Ruddiman in 2003 as a result of early forest clearance. Atmospheric compositions and soil management practices are only two indicators of anthropogenic activity, but relatively few examples of solid, human-made materials are preserved in the sediment record. Even rarer are items that are correlatable on a global scale. Given the ubiquity of non-degradable plastic debris on our planet, the possibility of their global preservation is strong. This study presents the first rock type composed partially of plastic material that has strong potential to act as a global marker horizon in the Anthropocene. Published in The Geological Society of America. In 1969, the third man to walk on the moon, astronaut Charles “Pete” Conrad Jr., also became the first lunar archaeologist. 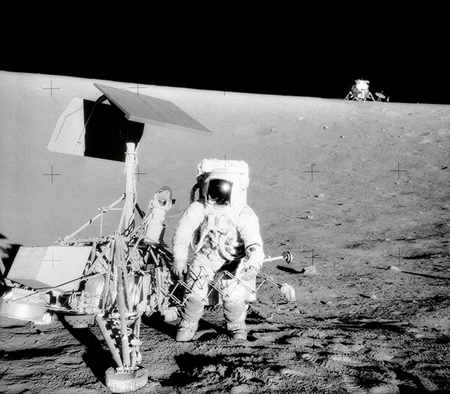 As part of the Apollo 12 crew, he examined an earlier robotic lander, Surveyor 3, and retrieved its TV camera, aluminum tubing and other hardware, giving NASA scientists back on Earth the evidence they needed to study how human-made materials fared in the lunar environment. 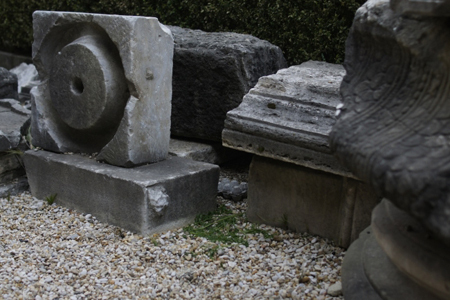 Like all astronauts who have visited the moon, Conrad also left behind artifacts of his own. Some were symbolic, such as the U.S. flag. Others were prosaic: cameras, dirty laundry and bags of human waste. NASA’s list of Apollo-related items left on the surface is 18 single-spaced pages. It ranges from geology hammers to earplug wrappers, seismographs to sleep hammocks. Even golf balls belonging to Alan Shepard, who managed some practice during Apollo 14, remain on the moon, though they appear to have escaped the notice of the list makers. All told, six manned landings, two manned orbital missions, over a dozen robotic landings and more than a dozen more crash sites offer signs of a multinational human presence on and around the moon. Each item left behind may seem like a small scrap for a man, but together they offer a giant look at mankind. The effort may not sound urgent. The moon has almost no air, water or geological activity to corrode or otherwise damage artifacts, but a new generation of missions are headed there and they boost the risk that someone or something will interfere with existing sites. The recent robotic landing by the Chinese National Space Agency, the first controlled landing since the 1976 Luna 24 mission, signals a renewal of sophisticated lunar exploration. This time around, more countries will be involved, as will commercial entities. Private organizations are in hot pursuit of the Google Lunar X Prize, which offers cash rewards for achieving technical milestones, one of which is landing near the Apollo sites. O’Leary’s interest goes back to 1999, when a graduate student in a seminar she was teaching asked if American preservation laws applied to artifacts left on the moon. O’Leary didn’t know, so she looked into the question, soon discovering that the Outer Space Treaty of 1967 prevents nations from making sovereignty claims in space. It does not address, however, the preservation of property that nations have left behind. O’Leary persuaded NASA to fund her research into the topic, and published what she calls the Lunar Legacy Project. She and colleagues created an inventory of the Apollo 11 landing site and began lobbying for its formal protection. By then, private companies such as Lockheed Martin were already discussing taking samples from other lunar sites for study. The hardware itself still belonged to the governments that put it there (the United States and Russia, the primary heir of the Soviet space program), but that would be little consolation if a modern mission ran over the first human footprints on the moon, for example, or moved an object without documenting its original location. O’Leary helped lobby California and New Mexico, states with strong ties to the space program, to list the Apollo 11 objects in their state historic registers. The move offered symbolic protection and attracted attention to the problem but didn’t do anything to solve it. There was, and still is, nothing to stop new visitors from interfering with objects already in space. Vandalism probably isn’t the biggest concern, but even unintentional interference is worrisome. Landing near existing sites could damage the sites, in the case of a crash or from the spray of lunar dust and rocket exhaust. “My concern would be that they miss,” says Roger Launius, senior curator of space history at the Smithsonian National Air and Space Museum. “If they miss by just a little bit, they could end up landing on top of the site.” And well-meaning archaeologists, though guided by the cultural legacy laws and professional codes wherever they work, do destroy part of what they study as a matter of routine. 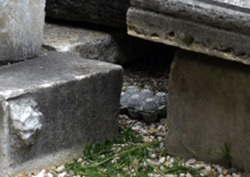 O’Leary would like the moon sites preserved as long as possible so that future archaeologists, perhaps with more sophisticated instruments and less damaging techniques, can examine them for clues about the human story of the landings. 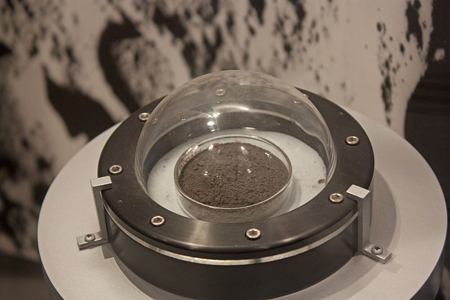 Scientists and engineers also have an interest in preserving the sites: They want to study how equipment left on the moon ages, like they did with the samples Conrad took from Surveyor 3. They also want to resolve questions about moon rocks that couldn’t be answered the first time around, including the size of a patch of orange volcanic glass discovered by geologist Harrison Schmitt during the Apollo 17 mission. Apollo 17 troctolite 76535. 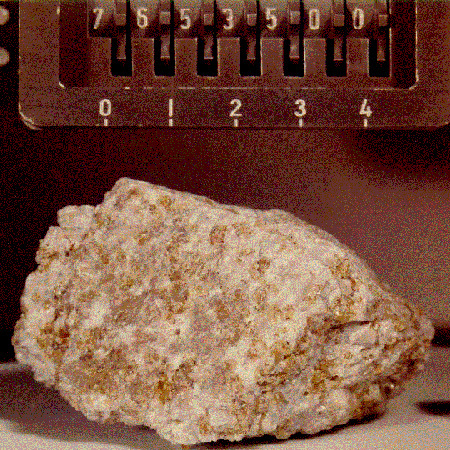 This sample has a mass of 156 grams and is up to 5 centimeters across. NASA/Johnson Space Center photograph S73-19456. 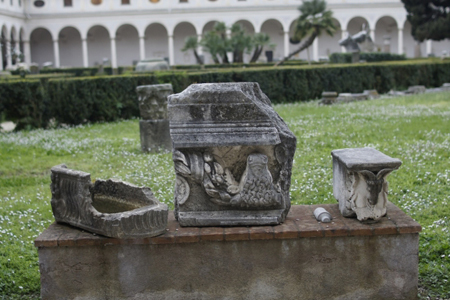 Leonid Tsvetkov grabs recyclable materials out of dumpsters and trash bins—plastic bottles, Styrofoam take-out packages, cardboard egg cartoons, soda cans and more—puts them in concrete casts, and then leaves them on and around ancient Roman monuments, carvings, and inscriptions. So far, he says, nobody’s noticed them. Can you? The idea came to him while, as a fellow at The American Academy in Rome, he was exploring the intersections of history, material culture, and consumption as they affect social and physical landscapes from antiquity until today. In his art studies, Tsvetkov realized that much of what we consider to be “artifacts” were trash in antiquity. Though egg cartons aren’t likely to be considered treasure any time soon, Tsvetkov’s work makes you think twice before sending something to the landfill. You never know, your old stuff could be a tourist attraction in a couple millennia. Between 1987 and 1995, archaeologists from the Garbage Project at the University of Arizona systematically excavated, hand-sorted, measured, and recorded thirty tons of contents from fifteen landfills located across North America — from California to Toronto and from the deserts of Arizona to the everglades of Florida. The information that resulted from these digs was unexpected. In contrast to all of the concern directed at fast food packaging and disposable diapers, the archaeological data demonstrated that both items together accounted for less than 2 percent of landfill volume within refuse deposited over the last ten years. Even more surprisingly, because of industry-wide “light-weighting” — that is, making the same form of item but with less resin — plastic grocery bags had become thinner and more crushable to the point that 100 plastic bags consumed less space inside a landfill than 20 paper bags. If all three items at the center of public concern had been banned and were not replaced by anything, the garbage archaeologists were certain that landfill managers would not have noticed the difference. At the opposite end of the contents’ spectrum were materials that occupied large portions of landfill space but received little public attention. Construction/demolition debris (C/D) was one. Because of definitional issues, C/D was not even included in the EPA’s national estimates of the refuse that goes to MSW (municipal solid waste, or standard community refuse) landfills. Like the EPA, the Garbage Project tried to avoid the issue of C/D in MSW landfills. In fact, the Garbage Project’s one sampling bias was an attempt to avoid areas where C/D was concentrated because it could easily disable expensive drilling equipment. Nevertheless, C/D accounted for 20 percent or more of excavated MSW by volume and was the second largest category of landfilled materials recovered by the Garbage Project. The largest category occupying landfill space was paper. This was true for refuse buried in the 1980s as well as for refuse dating as far back as the 1950s because in most landfills paper seemed to biodegrade very slowly. As a result, by volume nearly half of all of the refuse excavated by the Garbage Project has been newspapers, magazines, packaging paper and non-packaging paper, such as computer printouts and phonebooks. Not long after the Garbage Project’s first reports of its landfill digs, the energy directed at passing bans was largely redirected toward “curbside recycling.” A number of communities began placing emphasis on reuse and recycling programs for C/D. Paper recycling promotions often stressed the need to keep paper out of landfills because it didn’t biodegrade as quickly as once hoped. An association of States Attorneys General determined from dig data that several products which claimed to be “biodegradable,” including some brands of disposable diapers and plastic garbage bags, did not biodegrade in landfills, and the false advertising of these products was eradicated. All of this was evidence that some crucial views of garbage held by policy planners, the media, and the public had changed — and that garbology had been validated as a new kind of archaeology. A RATIONALE FOR THE GARBAGE PROJECT. For as long as there have been archaeologists, there have been guesses about what these behavioral scientists would discover if they were to analyze their own society’s refuse. While often humorous, such speculations are, in fact, based on a serious rationale: If archaeologists can learn important information about extinct societies from patterns in ancient garbage, then archaeologists should be able to learn important information about contemporary societies from patterns in fresh garbage. The pieces of pottery, broken stone tools, and cut animal bones which traditional archaeologists dig out of old refuse middens provide a surprisingly detailed view of past lifeways, just as all the precisely labeled packages and the food debris and the discarded clothing and batteries in modern middens reveal the intimate details of our lives today. If indeed there are useful things to learn from our garbage — things which can enrich human lives and minimize the undesirable environmental consequences of the industrialized world — why wait until we are all dead and buried to find them out? Garbology now! At least that is what Dr. Bill Rathje and a group of students thought when they founded the Garbage Project at the U of AZ in the Spring of 1973. Today, Rathje and the Project, including co-director Wilson Hughes who was one of the founding students, are still thinking along these same lines. Over the last 23 years the Garbage Project has literally immersed itself in fresh refuse placed out for collection and in materials exhumed from landfills. Fresh discards are recorded in order to study food waste, what people eat and drink, recycling behaviors, household hazardous wastes, packaging discards, and even the relation between fluoride and tooth decay. In 1987, when the Garbage Project added the excavation of landfills to its research repertoire, investigations focused on the composition of landfilled wastes, the rate of breakdown of these materials within landfills, the contribution of residential hazardous wastes to the leachate (or fluids) which leak out of MSW landfills, and the impact of various waste reduction strategies — recycling, composting, “source reduction” (which just means “using less stuff” in the first place) — on what wastes are landfilled. Today, the Garbage Project’s fresh refuse records, compiled from the long-term ongoing study in Tucson, AZ, and short-term studies in five other cities, form a one-of-a-kind database which currently encompasses 23 years of time depth. Abstracts of an article originally appeared as Rathje, WL. The archaeology of us. In Ciegelski, C.(ed. ), Encyclopaedia Britannica’s Yearbook of Science and the Future–1997 (New York, Encyclopaedia Britannica), 158-177, 1996.